Wednesday November 7, 2018 - A section of Kenyans have blamed National Super Alliance (NASA) leader, Raila Odinga, after Gor Mahia FC was thrashed by Everton FC on Tuesday night at Goodison Park in Liverpool. The match, which was screened live by a few local TV stations, was an embarrassment to Kenyan football because Everton easily won the match by 4-0 to clinch the SportPesa Trophy. 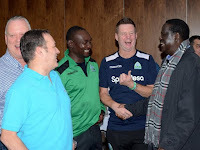 Gor Mahia Patron Raila Odinga had rallied the Green Army in his pre-match talk saying “Wana mbili na nyinyi mko na mbili… hawana tatu, ni wanaume kama nyinyi!” but that turned out to be mere motivational talk as The Toffees only needed 23 minutes to prove their might. Here are some comments from Kenyans. “#EFCvGOR should we blame Gor mahia or Raila for being present and Ruto for being absent,” Patronilla . “Me checking Gor Mahia fans expecting a win over Everton and knowing very well Raila Odinga is there,’’ Anne Mugechi.